Looking for a job can be expensive. 2. Where Do I File My Unemployment Expenses on Schedule A? 3. Can Air Ticket Tax Be Deductible When Filing a Tax Return? Looking for work can be a job in itself when you’re unemployed. And job hunting isn’t always cheap. 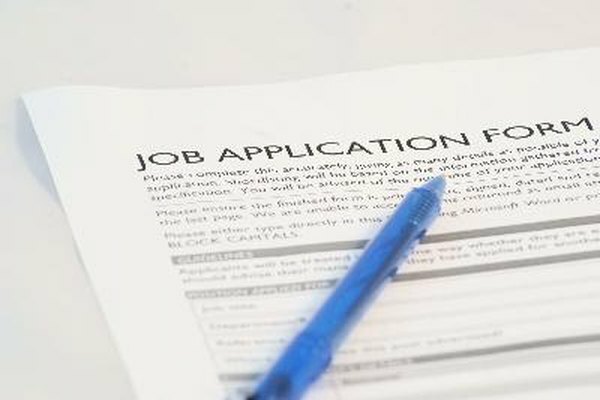 You may have to travel for interviews, hire someone to help you produce a professional résumé, or take classes to update or improve your job skills, all at a time when you aren’t bringing in a regular paycheck. The tax code recognizes these expenses and allows you to deduct some of them if you itemize your taxes and meet a few other requirements. Keep good records and receipts so you’ll know what to deduct come tax time. You can deduct the costs of almost anything directly associated with your job search, including the cost of printing and mailing résumés, the costs of any ads you pay for, paying to list your information with a headhunter or job search firm, paying a job coach to help you improve your interviewing skills and classes you take in your field to update or improve your skills. You can also deduct the cost of transportation to interviews, tolls and parking fees, and long-distance phone calls for telephone interviews. If you travel to another city or state for an interview you can deduct your transportation costs, as well as the cost of your hotel, rental car and meals while you’re in town. You can deduct these expenses even if you don’t have interviews scheduled but visit companies and attempt to set up interviews while you’re there. If you land a job in another city or state, you can deduct the cost of moving to take the new job . You can’t deduct the cost of new clothes or haircuts for an interview. If your spouse or someone else accompanies you on an out-of-town job-hunting trip, you can’t deduct that person's transportation, meals or additional charge for the hotel room, or any other additional expenses related to your spouse’s presence. If you buy anything to aid your job hunt that could be used for another purpose – a new computer or printer, for instance – you can’t take a deduction for that expense. Keep all your receipts and note on the receipt the job-related purpose. For example, on an airline ticket you might note, “Trip to Atlanta to interview with XYZ Company.” Also, keep a journal or log showing your daily job-hunting activities. Should the IRS ever question your job-hunting expenses, the journal serves to back up your claim that your trip to Atlanta wasn’t a vacation but a serious effort to find work. To take deductions related to your job hunt, you must itemize deductions on Schedule A of Form 1040. Job-hunting expenses are classified as Miscellaneous Deductions. You’re allowed to take only the amount of miscellaneous deductions that exceeds 2 percent of your adjusted gross income. Add all of your miscellaneous deductions, both those related to job hunting and other miscellaneous expenses. Multiply your adjusted gross income by 2 percent and subtract this figure from the total of your miscellaneous deductions. The amount left over is the amount of the deduction you’re allowed to take. For your job-hunting expenses to be deductible, you must be job hunting in the same line of work in which you were previously employed. So if this is your first job search or you are changing careers, your expenses aren’t deductible. Also, the IRS doesn’t allow job-hunting expenses when someone is returning to work after a “substantial” period of unemployment. The tax code doesn’t define substantial, but returning to work after a number of years, for example, 10 years you took off to raise children, would rule out being able to deduct your job-hunting expenses.